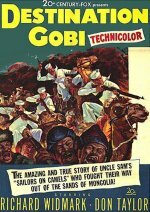 A weird Second World War western, with a US Navy contingent sent to observe weather conditions in the Gobi desert where they join forces with the Mongol hordes to fight the Japanese. Richard Widmark delivers his usual no-nonsense performance in what is a load of old nonsense, despite the fact that it claims to be a true story. Robert Wise, later the director of The Sound of Music and The Sand Pebbles, keeps the desert scenery shifting while the story, which even finds time for romance between a marine and a Mongol maiden, remains fairly static.